A free festival where all are welcome. 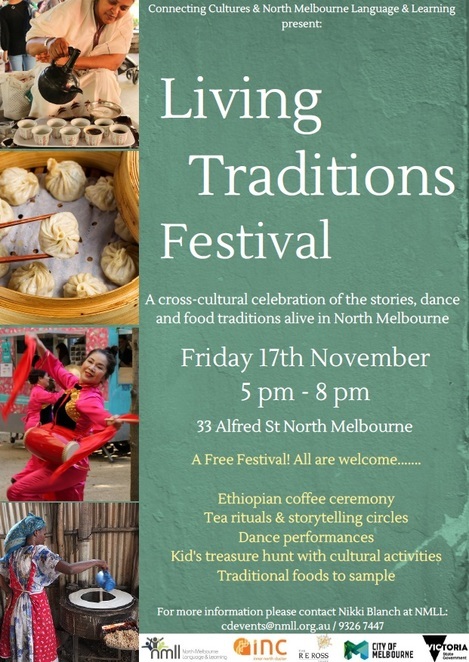 The Living Traditions Festival at 33 Alfred St, North Melbourne on Friday 17 November 2017 from 5pm to 8pm is an opportunity for community members from all cultural backgrounds to get together and celebrate cultural diversity. This, in turn, promotes intercultural exchange and understanding through participating in activities and events. From an Ethiopian coffee ceremony, tea rituals, dance performances, storytelling circles, traditional foods to sample and kid's treasure hunt with cultural activities, there's something for everyone. Be sure to stay updated via the Facebook page for program of events closer to time. This event is presented to you by Connecting Cultures and North Melbourne Language & Leaning (NMLL). NMLL is a registered Neighbourhood House and is continually expanding its Community Development Program to empower the CALD (Culturally and Linguistically Diverse) residents of North Melbourne by providing English classes. Their reach, however, goes beyond that and they're recognised for enriching and empowering the lives of the people they serve.